Ethylene Propylene Diene Monomer (EPDM) is durable synthetic rubber roofing membrane used for low-slope applications in commercial structures. It has two primary ingredients: ethylene and propylene. Both are derived from oil and natural gas. EPDM is available in a wide variety of sizes but only two colors, black and white. You can also install them in two thicknesses, 45 and 60 millimeters. We adhere EPDM to your building’s roof using a variety of methods including liquid adhesives, mechanical attachments, ballasts, or industry-grade tape. EPDM has been around for over 40 years. Since its inception, its become one of the most popular types of roofing material on the planet. We work with architects, building owners, and designers to implement EPDM roofing on all kinds of structures. We have discovered that there are several advantages to utilizing this type of material. 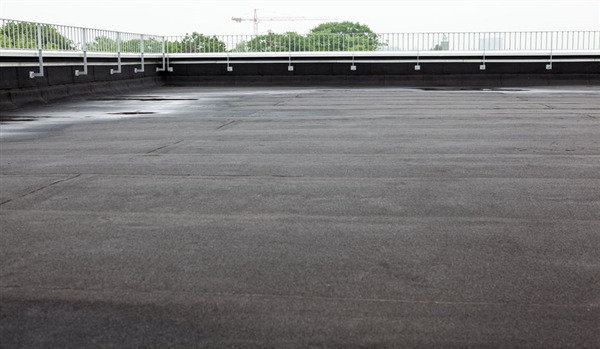 In addition to its ability to withstand extreme weather conditions, there are also several benefits to installing EPDM roofing material on your commercial roof. Below we list a few. ● Exceptional Durability. EPDM is resistant to ozone, UV radiation, and harsh temperatures. With carbon black fillers inside the material, EPDM absorbs UV radiation and converts it to heat, to which the membrane resists very well. EPDM has no plastic material in it, so there is no danger of the material becoming brittle from plasticizer loss throughout the life of the roof. ● Fast Installation. EPDM is available in large panels (30.5m x 5.8m) that can be installed using primers and self-adhesive products, no flames or electricity is required. ● Low Repair Costs. With little or no maintenance required throughout the life of an EPDM roof and a competitive installation cost, EPDM roofing systems result in few repairs or component replacement. ● Works in Any Climate. EPDM stretches to accommodate building movements in climates anywhere on the globe. EPDM has proven performance in Minnesota winters and southern tropical regions. ● Eco-Friendly. EPDM has minimal impact on the environment during manufacturing, installation, and use. EPDM can also be reused when the time comes to install a new roof. Intelligent Design specializes in commercial roofing for all types of structures large and small in Minneapolis and St. Paul, Minnesota. If you have a hail damaged roof or looking to get a brand new roofing replacement, we can help you every step of the way. To schedule an initial consultation, call us at 763-315-0745, or you can message us on our contact page. We protect your business with a solid EPDM roof today! Did Your Roof Survive the Long Minnesota Winter?